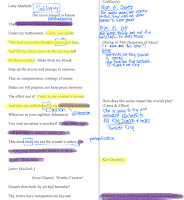 The Collab Blog: To Read or Not to Read? Can Shakespeare fit in a Standards-Based English Curriculum? To Read or Not to Read? Can Shakespeare fit in a Standards-Based English Curriculum? Recently I have been involved in a lot of conversations about Standards-Based Grading and what that looks like in an English class. These meaningful conversations have also forced me to ask myself a lot of difficult questions. If I am working to implement SBG, does that imply that I should only be teaching skills and not the content? Is the text we are selecting an appropriate vehicle for helping students access, learn, and master the skills? 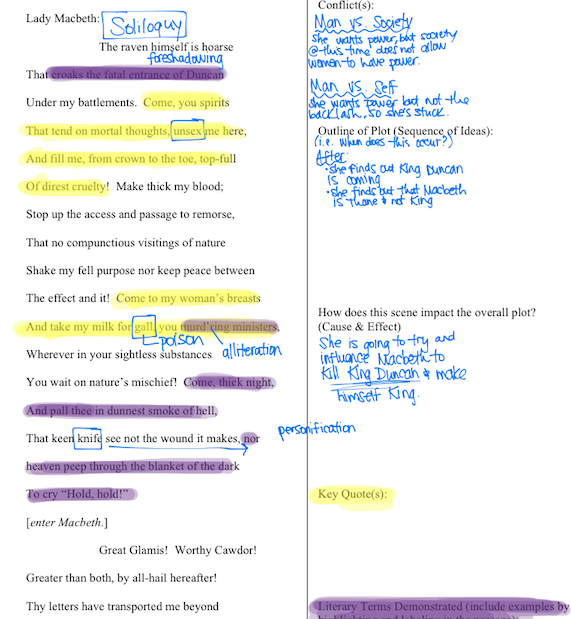 Can the average, non-AP student practice and demonstrate mastery of reading skills while reading Shakespeare? In having these conversations with colleagues and friends, I have discovered that many schools have removed Shakespeare from their English courses, at least at the regular level. This realization makes me incredibly sad for those students and those teachers. Not only will those students be missing out on the cultural relevancy of Shakespeare’s works, but they are also missing an amazing opportunity to see that reading skills are the necessary key to unlocking and appreciating the true meaning of a text. We are currently reading Macbeth in my Sophomore World Literature & Composition classes, and I believe that it has been an amazing text to use for a skills-based curriculum. Because the text is difficult and the comprehension does not come easy, students are forced to closely analyze the language, literary devices, word choice, themes, etc. in order to have any real understanding of the play. 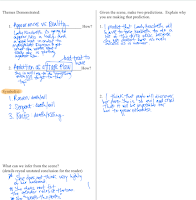 One of my colleagues, Matt Snow, shared with me an entirely skills-based scene analysis activity that he uses at the honors level. Students are required to read for conflict, sequence of events, cause and effect, key quotes, literary terms, symbols, themes, inferences, and predictions. The first time I showed it to my regular students, they were pretty scared. Even though we had practiced all of these skills with other texts, they thought there was no way they could possibly be successful when the same practice was applied to such a difficult text. I am not going to lie, it was not easy for them. I had to do a lot of facilitating and guiding the first time through, but I have gradually been able to pull away and put all of the responsibility on the kids. They really had to work together with their groups and grind through some of the tougher questions, but it was amazing to watch. By repeating this practice with several parts of the play, their mastery of the skills has grown in conjunction with their mastery of the content. I have rarely seen students as proud of their work as they were with this skills-based activity, and it provided me with some really clear formative feedback on their reading skills. More importantly, it gave my students such a great sense of accomplishment knowing that they could use their reading skills to tackle the subtleties, nuances, and deeper meanings of a text that they could not even begin to comprehend on the first read. There is a reason that Shakespeare has been read in English classes for so long, and I think his plays definitely still have a place in a Standards-Based Grading curriculum. For an additional blog post about teaching Shakespeare through graphic novels, check out this post!